One of the first steps towards automating repetitive tasks is to become familiar with the command line. In this chapter we will accomplish this by using the command line to extract UniProt identifiers for all human proteins in Swiss-Prot. More precisely we will be using a terminal emulator to run Bash. A terminal emulator is an application that gives you access to another program known as the shell. The shell allows you to interact with the operating system’s services and programs. The most widely used shell and the default on Mac and most Linux based distributions is Bash. You will get the most benefit from this chapter if you work through the example as you go along. You are therefore encouraged to open up a terminal now (Fig. 2)! Fig. 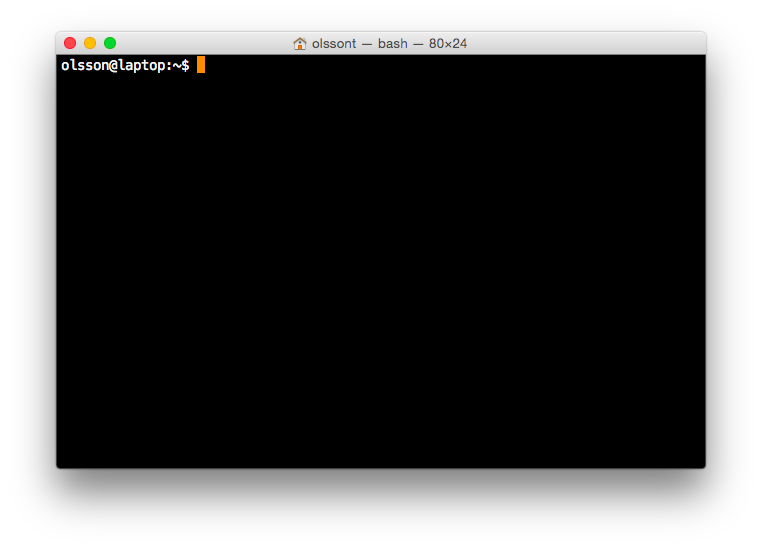 2 Bash shell running in a Terminal application. The prompt displays the the name of the user (olsson), the name of the machine (laptop) and the current working directory (~). Note that the dollar symbol ($) is an indication that input is expected, i.e. the shell expects commands to be entered after it. The prompt displayed in the Bash shell can be customised. As such the prompt on your system may look different. On Macs the command line is available through the Terminal application. There are a number of terminal emulators available for Linux. If you are using the Gnome-based desktop the default is likely to be the Gnome Terminal. On Windows things are a little bit more complicated. Windows does not come bundled with Bash by default. I would recommend installing VirtualBox and running a Linux distribution such as BioLinux in it. VirtualBox is a so called hypervisor that lets you run a virtual machine. In this scenario you would run BioLinux as a virtual machine. For more information on how to run BioLinux as a virtual machine see the BioLinux installation notes. The benefit of learning how to use Linux/Mac and Bash is that most bioinformatics software are developed on and designed to run on these platforms. Furthermore, the terminal and Bash provides an excellent way of creating analysis pipelines. More descriptive documentation can usually be found using the man (manual) command. For example to view the manual page of the ls command you can run the command below. To get out of the “man-page” press the “q” key. Just like I encourage you to try out the examples outlined in this chapter, I also encourage you to examine the help and man-page documentation for the commands that we use to get a better understanding of what the commands do. First of all let us make sure that we are working in our home directory. The cd command, short for change directory, is used to move between directories. If called without a path to a directory it will move you into your home directory. We can print out the name of the current working directory using the pwd command. Furthermore we can list the contents of a directory using the ls command. Now that we know where we are and what files and directories are present let us create a new directory for our project. This is achieved using the mkdir command, short for make directory. After having created the directory move into it using the cd command. When using the command line one learns to avoid using white spaces in file and directory names. This is because white spaces are used to separate arguments. In the example above we used underscores instead of white spaces. However, one could just as well have used hyphens. This comes down to personal preference. It is possible to represent file names with spaces in them on the command line by using the backlash character (\) to “escape” the whitespace, for example first\ steps\ towards\ automation or by surrounding the text in quotes "first steps towards automation". UniProt (Universal Protein Resource) is a comprehensive resource of protein sequences and annotations. The UniProt Knowledgebase (UniProtKB) consists of Swiss-Prot and TrEMBLE. Both are annotated. However, the procedure in which they are annotated differ. TrEMBLE uses an automatic annotation system, whereas the annotation in SwissProt is manual and includes a review process. You should see a whole lot of HTML text appearing in your terminal window. However, because we are going to download a large file we would like to write it to disk for future use. Many command line programs allow the user to specify additional options. In this particular case we can use the --output option to specify a file name that the output should be written to. To exemplify this let us download the BBC home page to a file named bbc.html. URL shortening is a means to make URLs shorter whilst still directing the client to the desired page. It is achieved by using a redirect from a domain that is short, to the page with the longer URL. To view the HTTP redirect code, 301 Moved Permenantly, you can use curl‘s verbose option. The downloaded file uniprot_sprot.fasta.gz has been compressed using the gzip protocol. We can extract it using the gunzip command. However, when extracted it more than doubles in size. So we will use the --to-stdout option to extract the content to the standard output stream whilst leaving the original file compressed. You should see a lot of FASTA lines printed to your terminal, or more formally the standard output stream. FASTA is a simple file format for storing nucleotide or peptide sequences. It consists of a single-line description, starting with the greater than symbol (>), and a sequence which can be spread over several lines. From now on the text will use the short -c option rather than the long --to-stdout option to save on typing. Remember that you can use the --help or -h option to get information on the meanings of the various options available to you. Another way to save on typing in the terminal is to use tab completion. Start typing the command that you want to use and hit the tab key. For example, type in gu and then press the tab key. This will complete the command to gunzip without you having to do any more typing. If the letters typed into the terminal are not sufficient to specify a unique command it will list all of the possible options. You can also use tab completion to fill in the names of existing files and directories. Now it is time to introduce one of the greatest features of the command line: pipes! Pipes are a means to redirect the output from one command into another. The character used to represent a pipe is the vertical bar: |. Rather than having to retype commands try using the “Up” and “Down” arrows to get access to previous commands. Pipes are powerful because they allow a set of simple commands to be combined to perform tasks that are beyond the scope of any of the individual commands. This has led to a central Unix philosophy of having simple programs that do one task well and a rich ecosystem of such programs. The user is then free to combine these programs to create personalised tools to automate repetitive processing tasks. Another powerful feature of pipes is that the program being piped to gets access to the output stream of data from the program piping data into the pipe as soon as it is available. This means that the processing of data can happen in parallel. Unix-based systems make a distinction between programs that are used for examining files, known as pagers, and programs that are used for editing files, known as text editors. The reason for making this distinction is to help prevent accidental changes to files when reading them. You should see something like the output below being written to the terminal window. The beauty of the head command is that it allows you to quickly view the beginning of a file without having to read in the content of the entire file. The latter can present a real problem if working on “big data” files. In fact, this is also the beauty of pipes, which allows downstream programs to work on the stream of data without having to wait for it to be written to or read from disk. Similarly, there is a tail command for displaying the tail end of a file, again ten lines by default. You may have noticed that the workflow above, to view the last ten lines, took a little longer to complete. That is because we needed to decompress the whole file before we could access the last ten lines of it. To page through an entire file one can use the less command. One can use the “Up” and “Down” arrows to navigate through the file using less. One can also use the “Space” key to move forward by an entire page, hence the term pager. To page back one page press the “b” key. When you are finished examining the file press “q” to quit less. How am I supposed to be able to remember that less is a pager? As you may have noticed, if one does not use a pager, the standard output is simply written to the terminal. This can be frustrating if the file is large and one wants to start reading at the top of the file and then page through it as one reads along. This is what pagers are for, moving through files one page at a time. One of the original pager programs was called more. It simply displayed one page of output at a time and when one wanted “more” output one simply pressed the space key. A usability issue with the more program was that it did not allow users to go back up a page. The less pager was therefore developed to work around this issue. It implemented reverse scrolling and a number of other additional features not present in more. However, less also implemented all the original features of the more program, resulting in the mnemonic “less is more”. Now that we have an idea of what the file looks like it is time to extract the FASTA identifiers that correspond to human proteins. To make the match more visible we can add the --color=always option, which will highlight the matched string as red. If you scroll through the matches you will notice that we have some false positives. We can highlight these by performing another grep command that finds lines that do not contain the string “sapiens”, using the --invert-match option or the equivalent -v short option. To make the search more specific we can search for the string “OS=Homo sapiens”. To do this we need to surround the search pattern by quotes, which tells the shell that the two parts separated by a white space should be treated as one argument. $ gunzip -c uniprot_sprot.fasta.gz | grep "OS=Homo sapiens"
To work out how many lines were matched we can pipe the output of grep to the wc command. Below are the first three lines identified using the grep command. Now that we can identify description lines corresponding to human proteins we want to extract the UniProt identifiers from them. In this instance we will use the command cut to chop the line into smaller fragments, based on a delimiter character, and print out the relevant fragment. The delimiter we are going to use is the vertical bar (“|”). This has got nothing to do with pipeing, it is simply the character surrounding the UniProt identifier. By splitting the line by “|” the UniProt id will be available in the second fragment. The command below makes use of the backslash character (\) at the end of the first line. This tells bash that the command continues on the next line. You can use this syntax in your scripts and in the terminal. Alternatively, you can simply include the content from both lines below in a single line, omitting the \. In the above the -d option specifies the delimiter to use to split the line, in this instance the pipe symbol (|). The -f 2 option specifies that we want to extract the second field. Remember to try out these commands on your computer to see the actual output of the commands. By default the output from commands are written to the standard output stream. Earlier we saw that we could use the pipes to redirect the output to another command. However, it is also possible to redirect the output to a file, i.e. save the output to a file. This is achieved using the greater than symbol (>). You can use the idea of an arrow as a mnemonic, the output is going from the command into the file as indicated by the arrow. There is a third type of redirection <. This type of redirection is so common that it is often made implicit. The two commands below, for example, are equivalent. Well done! You have just extracted the UniProt identifiers for all human proteins in Swiss-Prot. Have a cup of tea and a biscuit. The remainder of this chapter will go over some more useful commands for working on the command line and reiterate some of the key take home messages. Okay, so you have had a relaxing cup of tea and your head is no longer buzzing from information overload. However, you have also forgotten how you managed to extract those UniProt identifiers. Note that the exclamation mark (!) in the above is required. After having run the history command the terminal window is full of information. However, you find it distracting to have all those commands staring at you whilst you are trying to think. Sometimes, for example if you try to view a binary file using a pager, your shell can start displaying garbage. In these cases it may help to run the reset command. In general it is advisable to use clear as it only clears the terminal screen whereas reset reinitialises the terminal. You want to store a copy of your human_uniprot_id.txt file in a backup directory. For this exercise let us start by creating a backup directory. Now we can copy the file into the backup directory using the cp command. The command above uses the original name of the file. However, we could have given it a different name, for example including the date. Finally, suppose that one wanted to rename the original file to use hyphens rather than under scores. To to this one would use the mv command, mnemonic move. Having experimented with the command line we want to clean up by removing unwanted files and directories. Think twice before deleting files, they will be deleted permanently. When using rm there is no such thing as recycle bin from which the files can be recovered.